Liz is delighted to showcase pieces from her award-winning Fairtrade jewellery collection in a pop-up window at Liberty London from Monday 19th June – Sunday 2nd July. The floral themed window, designed to complement the botanical theme of the Fair and Fine jewellery, focuses on the Wild Rose collection. Inspired by Liz’s lifelong love for botanicals, combined with her passion to work with fair and sustainable precious metals, the Wild Rose is a classic design at the heart of the collection, artisan-made in 100% Fairtrade rose and yellow gold vermeil. 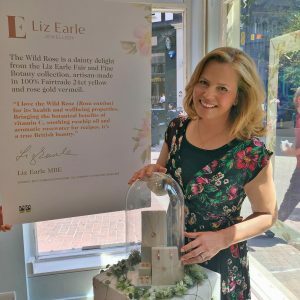 Speaking ahead of the launch of the window, Liz Earle said “I’m thrilled that my award-winning jewellery is on display in the window at Liberty London for two weeks this June. The Fair and Fine jewellery line is made exclusively from certified Fairtrade gold and silver from South America where the work of the Fairtrade Foundation has completely turned around the lives of artisan miners”. She added “A symbol of love and femininity, the Wild Rose is a classic design at the heart of the collection and beautifully presented in the Liberty window. I hope as many people as possible have the opportunity to come to Liberty to see the window for themselves”. Subindu Garkhel of the Fairtrade Foundation said “Buying Fairtrade Gold makes a real difference to the lives of miners, their families and communities. We are delighted that Liz Earle’s Fine and Fair Fairtrade jewellery collection is on display at Liberty and hope that this will help raise awareness of the work of the Fairtrade Foundation”. To find out more about Fairtrade jewellery click here and shop the collection in full here.